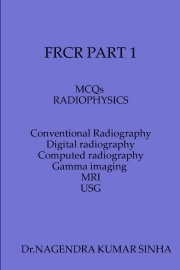 Description of "FRCR PART 1 MCQs Radiophysics Conventional Radiography Computed Tomography Digital Radiography Gamma imaging MRI"
There are about 1200 MCQs (1200 x5 =6000 statements) covering each and every aspect of syllabus of FRCR including MRI and USG..Each MCQs is followed by answer with detailed explanation with reference. Most of MCQs are based on two most important books for FRCR ---1. 4th edition ,1990 reprinted 2010 , Christensen’s Physics of Diagnostic radiology and 2.second edition(2008),Farr’s Physics for Medical Imaging. A consultant radiologist ,Dr Nagendra kumar sinha has passed MBBS from Patna Medical College and Hospital ,Patna ( Bihar ,India ) and got his MD ( Radiodiagnosis ) degree from Assam medical College and Hospital,Dibrugarh ( Assam,India ).He has worked as DM ( Neuroradiology ) resident at AIIMS,New Delhi ( India ).He is the author of two books ---FRCR MCQs Physics ( MRI and USG ( Pothi.com ) and MCQs in Radiology(Pothi.com ).He remains actively involved in different CMEs and conferences . He administers Nagendra's Radiology Blog(http://nagendraradiology.blogspot.com/) and PATH TO SUCCESS blog(http://nagendraway.blogspot.com/).He has keen interest in personality development and matters of spritualism. Reviews of "FRCR PART 1 MCQs Radiophysics Conventional Radiography Computed Tomography Digital Radiography Gamma imaging MRI"